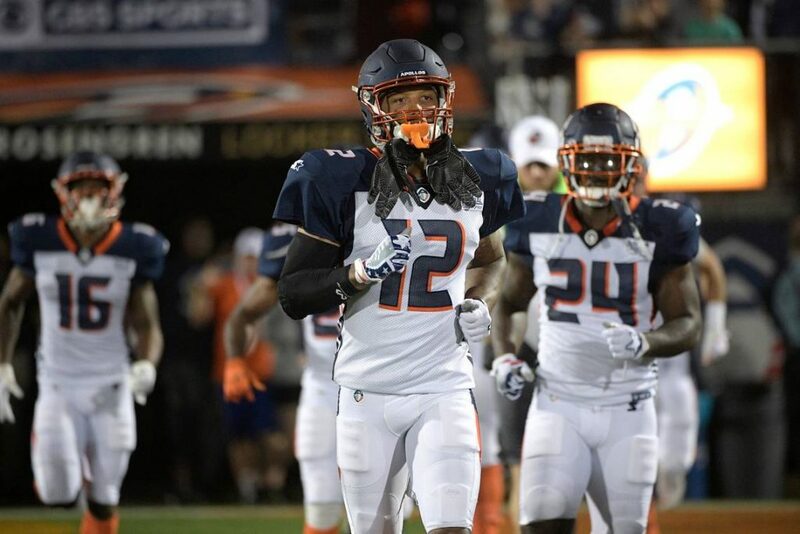 The Orlando Apollos finally saw their five-game winning streak to open their inaugural season come to an end when the Arizona Hotshots ended their three-game losing streak with a 22-17 victory. Orlando took the lead early on a 5 yard touchdown pass from Garrett Gilbert to Charles Johnson. However, things would turn quickly from there as Arizona would score 14 of the next 17 points to take a 14-9 lead heading into the half. After neither team was able to put up points in the third quarter, Orlando would retake the lead on a Gilbert 17 yard pass to Jalin Marshall for the touchdown. After the two-point conversion was successful, Jhurell Pressley would put the Hotshots back on top with a 1 yard touchdown run. The two-point conversion gave Arizona a 22-17 victory. A 6-0 San Antonio Commanders lead quickly turned into an 20 point as the Commanders crushed the Atlanta Legends 37-6. The loss snapped a two game winning streak for Atlanta, third in the Eastern Conference. Three straight touchdowns staked the Commanders to the early lead. Trailing by 20 with about 10 minutes left in the half, Aaron Murray would complete a one yard touchdown pass to Tarean Folston on fourth and goal at the 1 to finally get Atlanta on the board. However, San Antonio would score the remaining 17 points of the game despite the fact that Atlanta held the ball for nearly 35 minutes. In fact, Atlanta dominated the statistical categories in every way except for on the scoreboard. Murray passed for 215 yards and a touchdown, completing an impressive 30 of 41 pass attempts, but he also threw three interceptions, one of which was returned for a touchdown. Atlanta mustarded just 65 yards on the ground. The total is set at 43.0 for this contest which is a pretty solid number. These two teams produced 46 points in their last meeting and we expect about that many in this contest as well. We look for Orlando to win, 34-13, so take the over.